This is the story of a conversion of a 1989 911 3.2 into a 1975 911 Carrera. The concept was to create a “brand new” 975 Carrera but with modern mechanics. 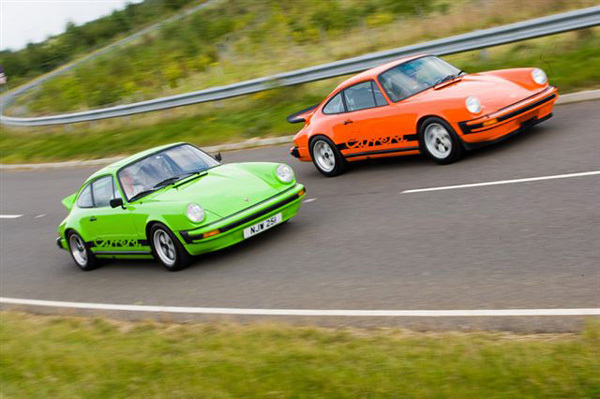 From the outside, it looks like a straight-out-of-the-showroom 1975 Carrera in the Lime Green of the era. However, underneath that smooth seventies exterior it has a 2008 competition specification engine, a bespoke braking system and pedal box, various handling and suspension upgrades and a brand new lightweight RS interior. Below is the car I based it on, although as you will see from the conversion photos, I chose not to fit a ducktail as I preferred the smoother line. Choosing between green and orange was tough, but working with the team on all the various specification options was a great part of the process. Quicker, more beautiful, more individual and a whole load more fun than a new Carerra 997, and for less money. Easy decision!